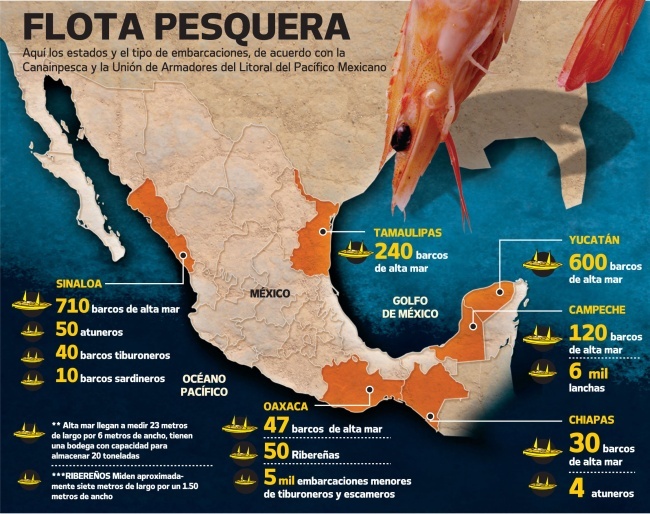 How important is the fishing industry in Mexico? The fishing industry now accounts for only 0.24% of gross national product. The relatively shallow waters off the Pacific coast and abundance of plankton in waters cooled by the Californian current make for particularly good fishing in the north-west. Together, Sinaloa (23%) and Sonora (22%) account for about 45% of the national total. Fishing is also economically important in Veracruz (8%), Baja California Sur (6%), Campeche and Baja California (5% each) and Yucatán. Almost three quarters (72%) of the total annual catch of 1.5 million metric tons is landed at Pacific coast ports such as Guaymas, Mazatlán and Manzanillo. Gulf coast ports like Tampico, Veracruz and Campeche, together with Caribbean coast ports such as Puerto Morelos and Progreso, account for a further 25% of the catch. The remaining 3% comes from inland lakes, rivers and fish farms. In terms of value, the most important species are shrimp, tuna and sardines. Fresh-water fish farms are becoming more common, with many of them specializing in the production of high value species such as trout and indigenous white fish. Mexicans consume only 13 kg (29 lbs) of fish per person per year on average, considerably less than the equivalent figures for the USA (21 kg), Canada (24 kg) or Spain (44 kg).